It’s been a busy few days around Scattertown. First, on Thursday night, Mr. and Mrs. Scatter took a break from the gala festivities of Science Night at Irvington Elementary School to scoot up the hill to Talisman Gallery on Alberta, where their friend Cibyl Shinju Kavan was having an opening of new assemblages. 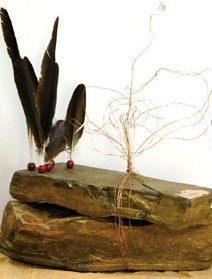 Scrolls, bamboo, feathers and rocks figure into the work, which is quite pleasing. Then, at midday Friday, the Scatter duo showed up at the Gerding Theater in the Armory to see dancer Linda Austin and her cohort J.P. Jenkins tear up the joint with a fascinating visual, musical and movement response to Mark Applebaum‘s elegant series of notational panels, The Metaphysics of Notation, which has been ringing the mezzanine railings above the Gerding lobby for the past month. Every Friday at noon someone has been interpreting this extremely open-ended score, and this was the final exploration. California composer Applebaum will be one of the featured artists this Friday at the Hollywood Theatre in the latest concert by Third Angle New Music Ensemble, the band of contemporary-music upstarts for whom Mrs. Scatter toils ceaselessly. Austin and Jenkins began by racing around the mezzanine and literally playing the hollow-steel guard rail, which was quite fun. They moved from pre-plotted base to pre-plotted base, always coming up with surprises, as the small crowd followed like Hamelin rats mesmerized by a piper’s tune. Mr. Scatter enjoyed the red fuzzy bargain-store microphone and the Sneezing Chorus and especially the shower of discarded clothing items floating down from the mezzanine into the path of the startled flower-delivery guy in the lobby below. Mr. Scatter took no photos, partly because the little camera doohickey on his cellular telephone is pretty much useless for anything more complicated than an extreme closeup snapshot of an extremely still object, and partly because he was just having too much fun to bother. But Lisa Radon of ultra was more disciplined and took some fine shots which you can ogle on her site. 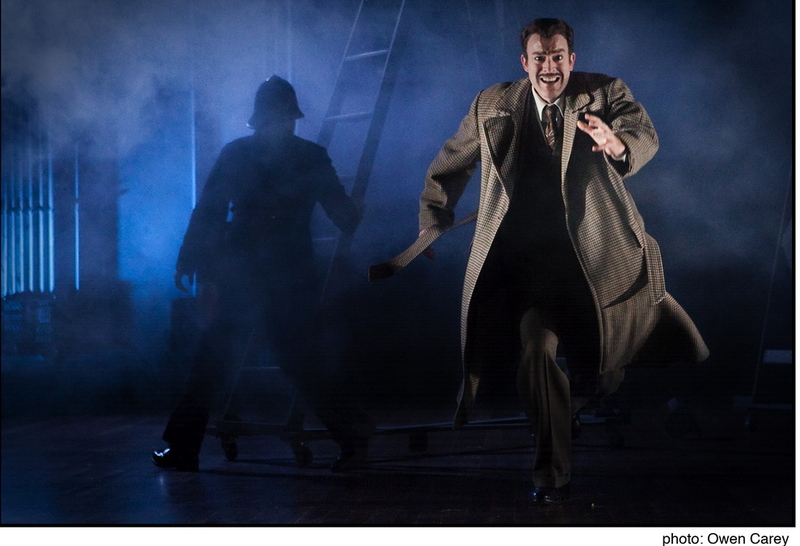 On Friday evening it was back to the Gerding for opening night of Portland Center Stage‘s comedy Alfred Hitchcock’s ‘The 39 Steps,’ which takes the 1935 movie thriller and blows it to preposterous proportions.